Before reading this book I knew barely anything of the 20th century history of Cambodia. Song for an Approaching Storm attracted me with its cover but also because it ticked several boxes for my current reading tastes as it was by an author I had never read before, was translated, and was about a section of history of which I had very little knowledge. Song for an Approaching Storm is set during about a month in the middle of 1955. The book is divided into three sections, each following one character. First we see things from the perspective of political dissident Saloth Sar; then we follow politician Sam Sary; and finally we dip into the life of Somaly, the beautiful young Miss Cambodia who happens to be engaged to Sar whilst having an affair with Sary. This is one of those books it takes a few pages to get into. The first section, following Sar, is written entirely in the second person, something I had actually not come across in I think any book I have ever read. It’s a little surreal at first and as the reader you feel disorientated and as if you should know more about what is going on that you do. But after twenty or so pages you get into the rhythm and things start to flow a bit better. The other two sections are written in the third person though, making me wonder why the author chose the second person for his section following Sar. 1955 was the year that Cambodia held its first democratic elections. 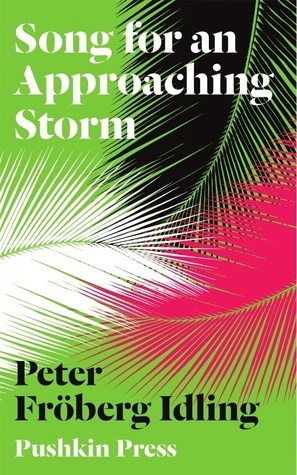 Song for an Approaching Storm takes place in the month leading up to the elections, with tension and paranoia at a height. Sar is an official member of the Democratic party, working to secure their victory; but he is also, secretly, a member of ‘the Organisation’, an armed Communist faction that plans to overthrow the government. The book opens with him attending a clandestine meeting with fellow comrades (though it is clear from the outset he knows he cannot really trust anybody), and we quickly see that he has dedicated his life to ‘the cause’. At this point in history Saloth Sar was very much under the radar. But even then he felt intensely paranoid about the secrecy and survival of the Organisation. This paranoia, and desire for both power and success, are traits that typified his later identity as Pol Pot. Purely within the context of this novel he is a passionate but insecure man who wants what he believes to be the best for his country. It is difficult – but not impossible – to see his transformation (if you can call it that) from this into the man we know as Pol Pot. A man who caused the deaths of millions of his own people (as well an many foreigners) for what he believed to be the greater good. I knew that he was a reviled leader, responsible for such horrors, but I am glad that I read about the facts of what happened after I read this novel. Though we all know that Sar is Pol Pot, I think it helps to see him here just as he was in 1955. We can then consider how his life at this point affected his later actions. All three characters are fascinating and have very disparate perspectives of the same situation, which helps to create a very vivid and ‘three-dimensional’ world for the reader. The atmosphere throughout is tense and murky with the heat and the politics – both equally intense – adding an extra element of strain. I was thoroughly impressed by both the writing and the construction of this novel. It tells a relatively simple story (especially as the action happens within such a short period of time) but Froberg Idling uses his structure and the nuances of language to delve deeper and bring out the multitudes of human issues that exist within every scene. Somaly is based on a real person, Soeung Son Maly, who had a relationship with Saloth Sar as well as Sam Sary. Little is known about the real Somaly (Google links to sites related to Sary) and the fictional version of her here is beautifully drawn. Crowned Miss Cambodia and with dreams of becoming a model, she hopes her relationships with the politicians will help boost her social status. She lives with her mother and a disgruntled maid, wishing for more freedom and idly flicking through magazines. She intrigued me and made me wonder what life was really like for her and her female counterparts. Song for an Approaching Storm is a very dense novel, full of so many things to think about – that’s part of why it’s taken me so long to write this review! I highly recommend it to anyone with an interest in history and/Cambodia, or those like me who knew nothing about the situation. Originally published in Sweden in 2012 by Natur & Kultur, and in the UK in March 2014 by Pushkin Press. My copy was kindly provided by Pushkin Press for review.